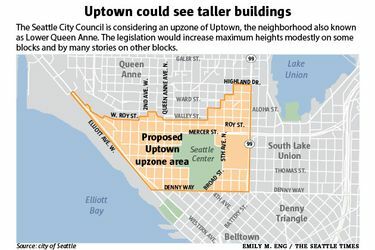 Taller buildings would be allowed in Seattle’s Uptown neighborhood, also known as Lower Queen Anne. Across most of Uptown, maximum heights would increase by one or two stories under a plan before the City Council. Closer to South Lake Union, maximums would reach to 160 feet. The Seattle City Council is considering an upzone of Uptown, with action expected as early as next month. 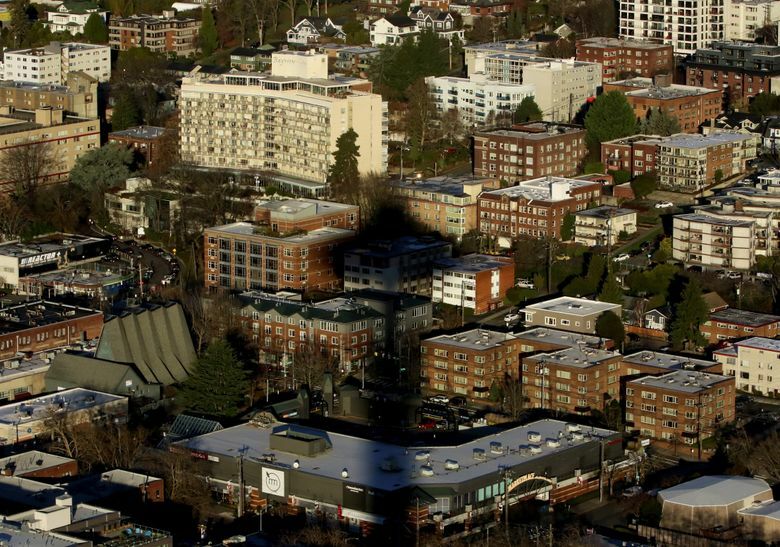 The legislationproposed by Mayor Ed Murray would allow developers to build higher in the neighborhood that wraps around Seattle Center and that is also known as Lower Queen Anne. And it would activate a program requiring developers to help create affordable housing. Across most of Uptown, maximum heights would increase slightly, by one or two stories. In the heart of the neighborhood, for example — around Queen Anne Avenue North and Mercer Street — the jump would be from 40 to 65 feet. In a triangle of land near South Lake Union, between Denny Way, Broad Street and Aurora Avenue North, maximum heights would increase more, from 85 to 160 feet. Change is coming to the neighborhood with or without the upzone: The city and Seattle Public Schools plan to build a new high school and stadium at Seattle Center; Sound Transit plans a light-rail station there; and the city is working on an agreement to renovate KeyArena. Uptown would be the latest neighborhood upzoned by the mayor and council this year, following the University District, downtown and South Lake Union, some Central District intersections and the Chinatown International District. Murray says the legislation would allow Uptown to better accommodate population growth and would generate low-income housing. Triggered by the upzone, the Mandatory Housing Affordability program would require Uptown developers to include rent-restricted apartments in their projects or pay fees. The city would use the fees to help nonprofits build rent-restricted apartments elsewhere in Uptown or in other neighborhoods. Built on site or with fees, the rent-restricted units would need to be affordable to households making no more than 60 percent of the area’s median income. This year, 60 percent of the area’s median for a family of four is $57,600 per year. Under, the mayor’s proposal, Uptown developers would need to devote 5 to 10 percent of their projects to affordable housing or pay $8 to $29.75 per square foot. Over 20 years, the city estimates Uptown development would create 600 low-income apartments under the Mandatory Housing Affordability program. The council plans to consider upzones of dozens more neighborhoods next year and could allow apartment buildings on some blocks now reserved for single-family houses. The Uptown upzone affects only blocks already zoned for apartments and commercial buildings. Besides allowing taller buildings, the legislation would introduce new development standards meant to make projects pedestrian friendly through amenities such as midblock connections. And it would offer incentives for developers to create open space and green streets as part of their projects. The council may amend Murray’s proposal. Councilmember Rob Johnson has suggested adding incentives for developers to build family-size apartments. Johnson, who chairs the council’s land-use committee, has also suggested capping the number of parking spots Uptown developers would be allowed to build. The committee held its second discussion on the legislation Tuesday and has scheduled a public hearing for 5:30 p.m. Sept. 11 at SIFF Cinema Uptown.